Introducing the completely reconfigurable user interface available for Morpheus playout automation and ICE channel-in-a-box systems. Morpheus UX delivers tremendous benefits by allowing operators to build precisely the type of user interface they need. In this way, operators can focus on events of significance — such as live events, or events with errors — rather than using up large amounts of screen space with “green” events that are guaranteed to go to air. Morpheus UX provides the tools to build user-defined panels, exactly appropriate for differing styles of playout operation and to build screens made of as many of these panels as needed. One of the major benefits of a web-based approach to user interfaces is the low processing requirement needed for the client terminals. This allows Grass Valley to help our customers by reducing the cost of ownership for client machines. Provided a suitable HTML5 browser is up to date and running well, there should be no problem running this on any recent PC. Grass Valley validates against the latest version of Google Chrome. Depending on the scale of the system, a separate web server may be needed from your Morpheus Playout Automation system. Grass Valley can advise on this when we discuss your needs. Grass Valleble, new approach to playout automation. Introducing the completely reconfigurable user interface available for Morpheus playout automation and ICE channel-in-a-box systems from Grass Valley, a Belden brand. Morpheus UX delivers tremendous benefits by allowing operators to build precisely the type of user interface they need. In this way, operators can focus on events of significance  such as live events, or events with errors  rather than using up large amounts of screen space with "green" events that are guaranteed to go to air. 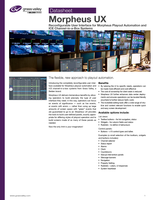 From simple playout operations to highly complex multichannel environments, Morpheus and ICE from Grass Valley, a Belden Brand, offer flexible and reliable solutions to smeet the demands of a shifting media and broadcast industry.